​ How do you turn right across a bike lane? In Washington you’ll want to check for and yield to bicyclists, then merge INTO the bike lane so you’re making your right turn from the curb. Washington’s law on right turns directs the driver to make the turn from “as close as practicable to the right-hand curb or edge of the roadway.” That brings up a question – on a road with a bike lane, is the edge of the roadway the line that separates the car lane from the bike lane, or is it the curb? 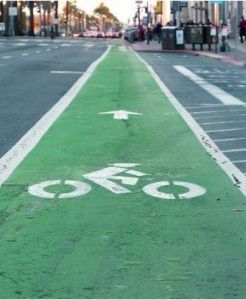 According to the Revised Code of Washington, the roadway is the portion of the highway “ordinarily used for vehicular travel.” Since a bicycle is considered a vehicle in the law, a bike lane is used for vehicular travel. That would imply that drivers should merge into the bike lane to make a right turn. However, many drivers understand a solid line in the roadway to mean “do not cross,” which confuses the situation. Many states have clear statutes regarding right turns and bike lanes; Washington doesn’t. Locally, traffic engineers are designing new bike lanes to include dotted lines at intersections, but we still have plenty of lanes with solid lines. So what do you do if you’re intending to turn right and there’s a solid white stripe for the bike lane? The law supports merging into the bike lane, but some motorists and cyclists may not expect it. Use caution and give each other a bit of grace; drivers and riders are still learning to coexist on the roads. Note that a car is not allowed to drive in a bike lane except when making a right turn. You may not drive in a bike lane to pass on the right to get around a car turning left. This is from an article in the Bellingham Herald.